The Beach is the main attraction at Koukounaries. 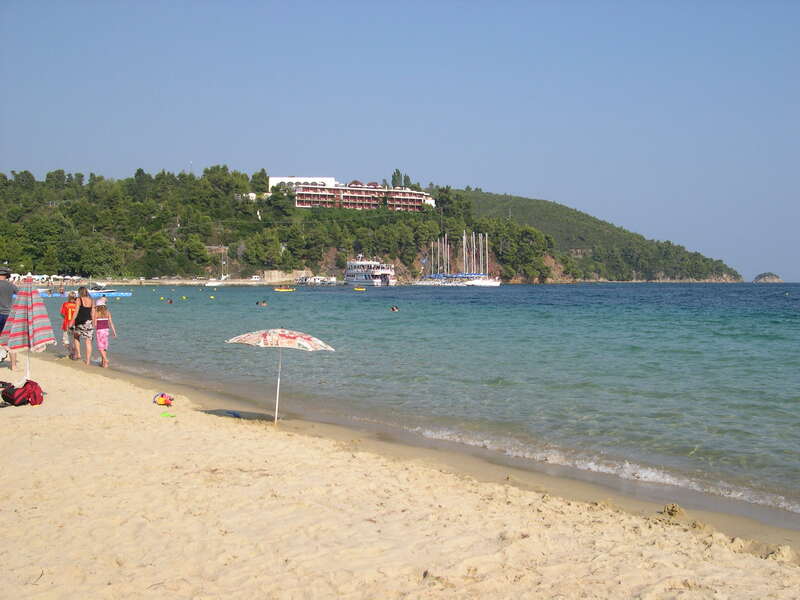 Koukounaries is the westernmost resort on Skiathos, situated at the end of the main road from Skiathos Town. The name Koukounaries means 'Pine Cone', which is appropriate as the region is surrounded by pine trees. The region of Koukounaries is a designated nature reserve, meaning that development here is restricted. As such, Koukounaries has escaped the blight of over development. However, Koukounaries is very busy in the peak summer months as tourists that are staying elsewhere on the island flock to the area, particularly the main beach. This beach, set beyond the lagoon, is a one kilometer long arc of fine golden sand that is often rated as one of the best ten beaches in Greece. If you prefer to spend your days away from the crowds, however, do not despair. There are several beaches within easy walking distance of Koukounaries, notably Banana beach which lies to the west of the resort. A forty minute walk through the pine trees to the north of Koukounaries lies the Mandraki peninsula. Here you will find the three quiet beaches of Xerxes, Elias and Agistri. There are several tavernas along the main road in Koukounaries and also a selection of small shops that sell basic supplies and tourist trinkets. Accommodation options include: studio appartments, villas with pools, and rooms to rent. There are two hotels in Koukounaries, one at either end of the beach. Koukounaries is serviced by a regular bus that operates a service along the main coast road, calling into Troulos and other small resorts before arriving in Skiathos Town. The bus service can become very busy at the end of the day, especially in the peak summer months, as the beach empties and tourists make their way back along the coast to their accommodation.